This section is from the book "Elements Of Woodwork", by Charles A. King. Also available from Amazon: Elements Of Woodwork. 8. 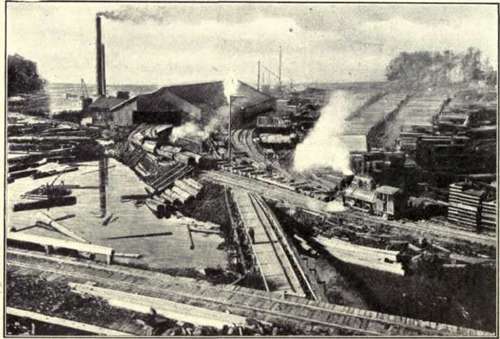 The manufacture of lumber. - (A.) 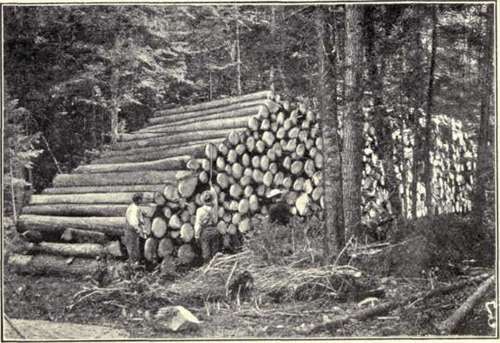 There are two distinct processes in the preparation of lumber for com mercial purposes, logging and sawing; the former includes all the steps from felling the tree to the delivery of the logs at the sawmill; there the logs are sawed into boards, planks, and timbers of cer tain dimensions, which are piled and exposed to the sun and air for a suffi cient time to allow a large part of the water in them to evaporate, when the lumber is said to be "weather dried," and ready for ship ment to the con sumer. Fig. 4. - Felling a Tree. (B.) If a lumber concern desires to begin operations in one of the great for est areas "land looker" or "timber cruiser" is sent to spy out the land, and to report upon the probable yield of timber within certain areas, and the con ditions which would aid or retard the work of getting out the logs. 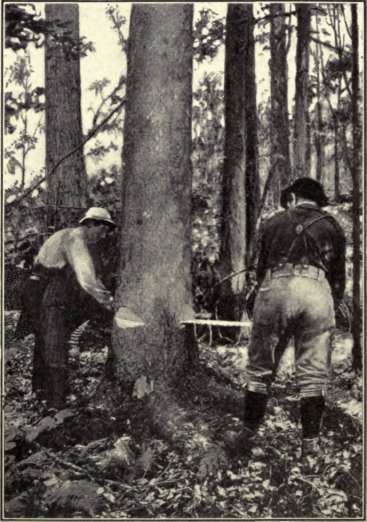 If the re port is favorable, the standing timber may be purchased by "stumpage," which means that a certain price will be paid for each thousand feet of lumber cut, or the land may be purchased outright, though in the early history of lumbering cases have been known where these little for malities were omitted. 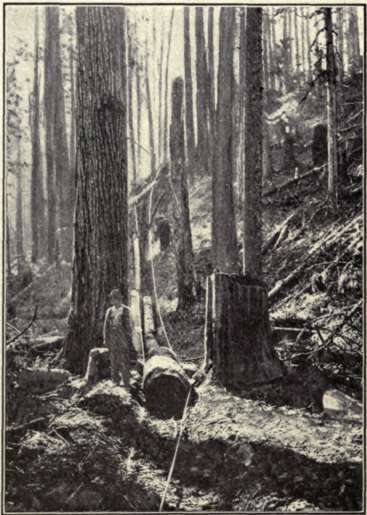 Camps are located at convenient points throughout the boundary, roads are made through the woods, and founda tions, or "skidways," built at right angles to them, to receive the logs as they are hauled down the "travoy" roads, which are narrow trails cut through the woods at frequent distances for this purpose. (C.) The above preparations completed, the work of felling the trees is begun (Fig. 4); this part of the work requires nice skill and judgment, as it is necessary that the tree should fall so that it will cause the least damage to itself and to surrounding trees. After the tree is down the branches are cut close to the trunk (Fig. 5) and carried to one side so that they will not be in the way of the horses. The trunk is then sawed into logs, twelve, fourteen, sixteen, or eighteen feet in length, as the. 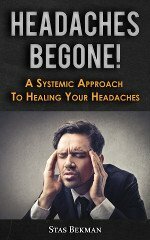 imperfections and the length of the tree trunk may allow. Longer or shorter logs are rarely cut except for special purposes. Fig. 5. - Cutting Small Branches from Felled Spruce. Fig. 6. - Skid way of Spruce Logs. Fig. 7. - Load of White Pine Logs. (D.) One end of the log is placed upon a drag, or is gripped by a pair of tongs, and hauled to the nearest travoy road and skidway, where it is piled (Fig. 6). 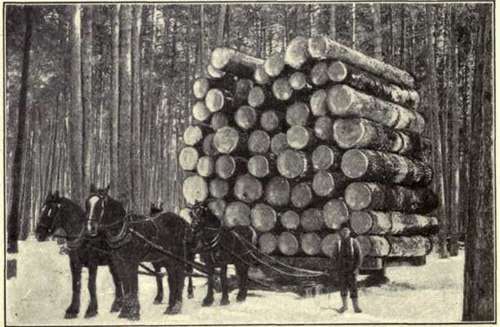 (E.) From the skidway the logs are loaded upon trucks, cars, or sledges (Fig. 7), and carried to the cable (Fig. 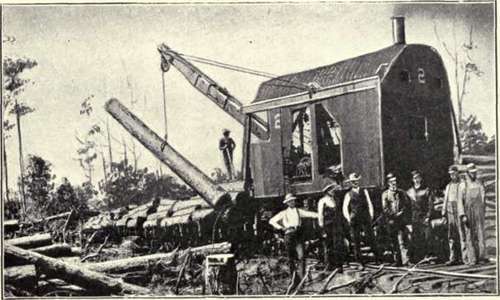 8), which is a method of hauling logs used in some parts of the country, or to the railroad (Fig. 9), or floated down a river (Fig. 10). 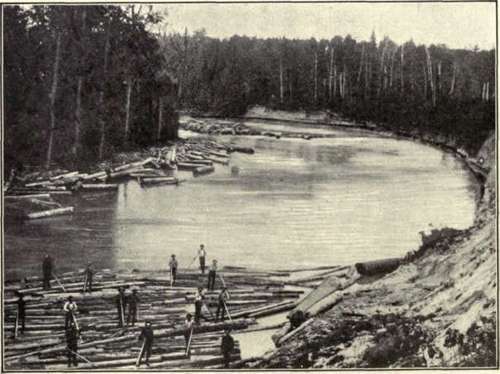 If either of these latter methods of transportation is employed, the logs are generally piled upon another skidway until there is enough for a train load, or until the conditions upon the river are favorable for them to be floated to the mill. Fig. 8. - Hauling Logs by Steel Cable. FIG. 9. - Loading Logs from Shedway to Train. Fig. 10. - Boom of Logs. 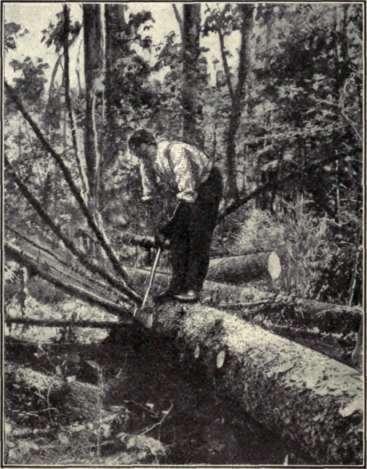 (F.) Figure 11 illustrates a jam of logs, which is gener ally the most dangerous obstacle the lumberman has to face. A jam usually depends upon one key log, which, if loosened, will allow the jam to break instantly. The work of loosening the key log is frequently done by one or two men, who must be men of spring steel nerves and muscles, and possessed of the highest possible skill and activity, or they cannot hope to break a large jam and escape with their lives. Fig. 11. - LOG Jam. (G.) The mill illustrated by Fig. 12 is one which re ceives its logs by both rail and river. In this case the logs which come in by rail are rolled into the river, as they can be more easily placed upon the chain feed of the mill. In winter, a small pond of water is heated, in which the logs are soaked before they are taken into the mill; this draws the frost out of them, and allows them to be worked much more easily. Fig. 12. - Sawmill in the Big Tree District. (H.) There are different types of sawmills, in which the logs are worked into commercial shapes. The small enterprises use portable mills, which are moved into the woods and located upon a tract of land, remaining until all the desirable timber in the vicinity has been sawed, and then moved to another locality and the process repeated. 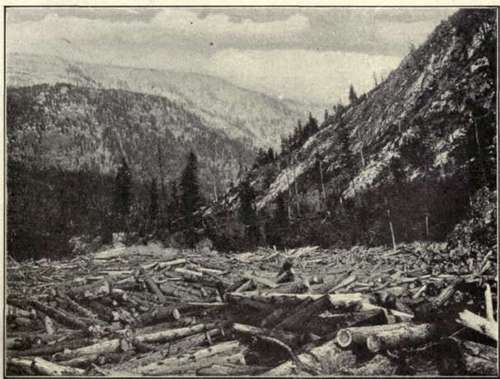 Large operations are conducted upon a different plan; mills of a permanent type are erected as near the forest as practicable, roads are built, tracks laid, and the logs brought from the woods by one of the methods previously illustrated; or, where it is feasible, flumes are built, and the logs floated in these to the mill. In erecting a mill of this sort, a location is selected upon a waterway if possible, as the logs may be floated more cheaply than by any other method of transportation, though some of the heavier woods will not float, and have to be handled on land. (I.) The immersion of logs in water also improves the quality of the lumber, as the action of the water upon the sap prevents to some degree the tendency to decay, and also facilitates the seasoning of the manufactured product. If the log is left in the water until it becomes water-logged, it will sink, and while it is not injured for many purposes, the wood loses some of the strength which it is supposed to have. In many localities, the salvage of sunken logs has become an industry.